The summer holidays are getting closer or might have already started for some of you, so looking for things to do with your children is bound to rank high on your to do list. 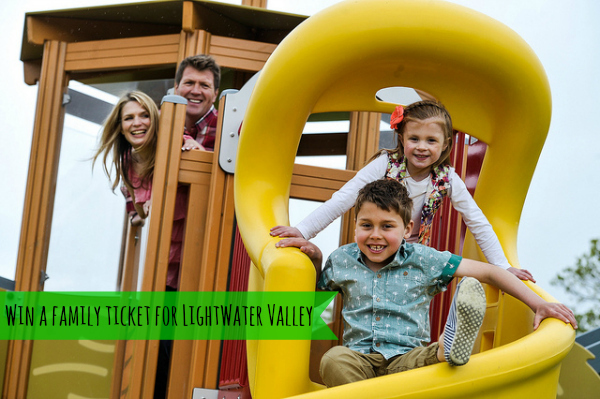 To make things a little easier for you, I have teamed up with the lovely people from Lightwater Valley who were generous enough to offer one lucky winner a family ticket for up to four people. Lightwater Valley is a theme park for the entire family and situated in North Yorkshire, only a short car journey away from York, Leeds and Bradford. With over 30 different attractions and rides, Lightwater Valley is the perfect location for a day out. Enjoy thrilling rides, adventure playgrounds, a farm for little ones and Lightwater Valley’s very own birds of prey show and make memories that you and your family won’t forget. I am a massive fan of falconry displays, so seeing the birds of prey show would definitely one of my highlights. Check out the video below for a little sneak peek of all the attractions at Lightwater Valley and if you want to join the fun, make sure to fill in the Rafflecopter form at the bottom of the post to be in with a chance of winning a family ticket for four. You’ve got to be in it to win it! To enter this giveaway, please fill in the Rafflecopter below. Please, be sure to follow the steps carefully as incorrect or faulty entries will be removed and not entered into the draw. Good luck! Previous Post: « What was your worst baby gift? My son would love the Angry birds activity park! The Angry Birds activity park sounds great. My two young girls would love the Angry Birds park. My sons would want to go straight to the angry birds place on the video!!! angry birds park looks amazing! Ted would love angry birds. Wild river rapids look fab, but so does the angry birds! My two would love The Ultimate – roller coasters are becoming a big favourite! My son would love the Angry birds park. The angry birds park, the kids would love it. Angry Birds! My 5 year old is AB obsessed! The Ultimate sounds great but then I'm sure I could carry off the ugly green colour I would no doubt turn at the end of it so I think I'll stick to the river rapids! In this weather a little water would be great to cool off! Thank you for a great competition. Angry Birds park would appeal to the kids I think. When we went last we enjoyed the big wheel after some initial trepidation! I want too take my toddler on the Angry Birds Playground! He's Angry Birds mad! Definately The Ultimate, its been that long since I went Id love to go back on it again. The Ultimate! It looks amazing! I've never been on The Ultimate – at 6 mins long it looks awesome! the swan boats look cute!! I think we would all love the Wild River rapids! My boys love the wet rides! I am old and miserable and wear a waterproof but they love it! I grew up going to LWV and I have always loved The Ultimate 🙂 I'd love to go back and take my daughter on it now shes big enough. Wild river rapids looks great!!! !